You have to see these stunning photos—they make such a powerful point about how natural and universal breastfeeding is. Breastfeeding often makes headlines for all the wrong reasons. We hear of women who are discriminated against, shamed and sexualized when feeding their children—but Ivette Ivens has done her part to show breastfeeding for what it really is: A beautiful, natural act that mothers of all walks of life employ to nourish their babies. Ivens is a photographer and mother whose recent project involves capturing stunning images of women breastfeeding—it's an endeavor inspired by her own experiences as a breastfeeding mom. “I realized how divine and powerful a woman is, and I had to capture it with my camera,” Ivens told The Huffington Post. Ivens shot women in their own homes and out in nature—regardless of the setting, the images are insanely beautiful. 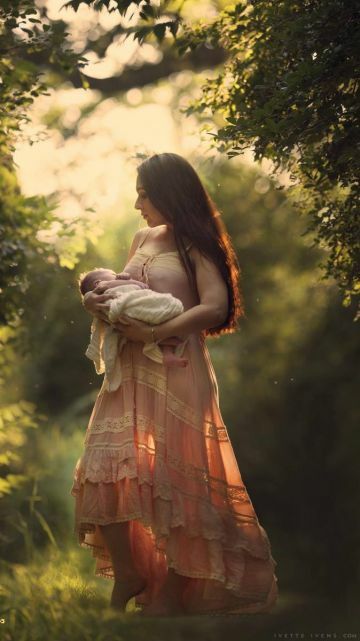 They have this soft, ethereal feel to them, and they make an incredibly important point: Breastfeeding is every bit as natural as backdrops Ivens chooses, and it's a universal act. Moms of all kinds do it for a simple reason: It's good for their children. Ivens has compiled her shots in Breastfeeding Goddesses, a coffee table book you can order for $49.99.